"In May 2017 I was involved in an accident which required an ER visit and extensive physical therapy and chiropractic work that I could not afford on my own. A friend referred me to Mr. Griffith's practice thankfully. Kirby and Chris were very helpful in working with me. All my medical bills were covered thanks to their work. I cannot recommend GriffithLaw highly enough!" 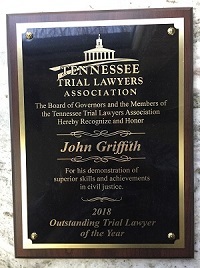 Chris T.
The skilled car accident attorneys at GriffithLaw serve clients throughout Tennessee, including individuals and families in Williamson, Davidson, Dickson, Franklin, Sumner, Rutherford, and Humphreys Counties. Learn more about the kinds of cases we’ve handled, and how we fought for the rights of victims, with these results from car accident cases. Each car accident case is unique and there is no average settlement value to a claim. These verdicts and settlements do not in any way guarantee similar outcomes for other clients or cases.